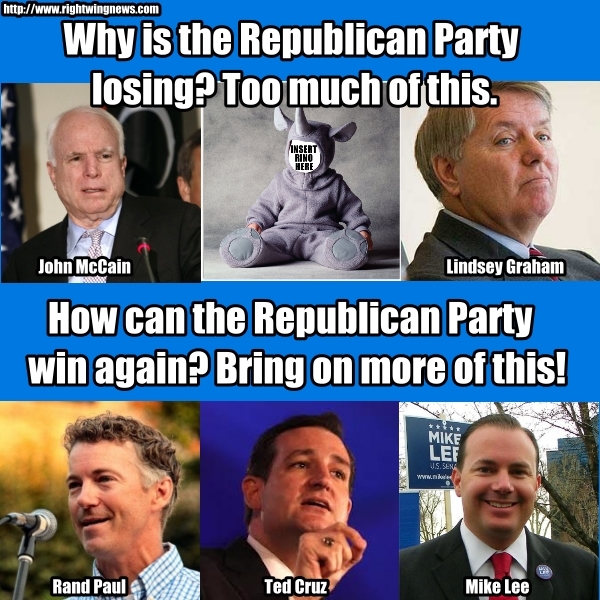 All the Republican Party Has To Do To Have A Wildly Successful 2014 Is…. ….hammer away relentlessly at the failures of Obamacare, spend next summer investigating Obama’s scandals, and make sure it doesn’t aggravate the base. Obamacare is a massive program that the Democrats have undeniable responsibility for and it’s the biggest disaster since the Hindenburg. The webpage disaster is so bad that even liberals are making fun of it and that’s only the tip of the iceberg. Tens of millions of Americans are losing their insurance, losing their doctor, and paying hundreds more per month for health care and in taxes. It’s pure political rat poison. Furthermore, all of Obama’s scandals are still out there percolating, ready to be explored in flashy hearings during the summer of 2014. This is a recipe for victory unless the Republican Party does something incredibly stupid, like continuing to aggravate its base. In fact, the reason Barack Obama is desperately trying to pivot to illegal immigration is an effort to get a spotlight off of Obamacare and on to the GOP fighting with each other for the next few months. The GOP should avoid that trap and stay locked on Obamacare like a bulldog instead of starting WW3 with its own base. Keep the focus where it belongs: on the failure of the Democrat Party.